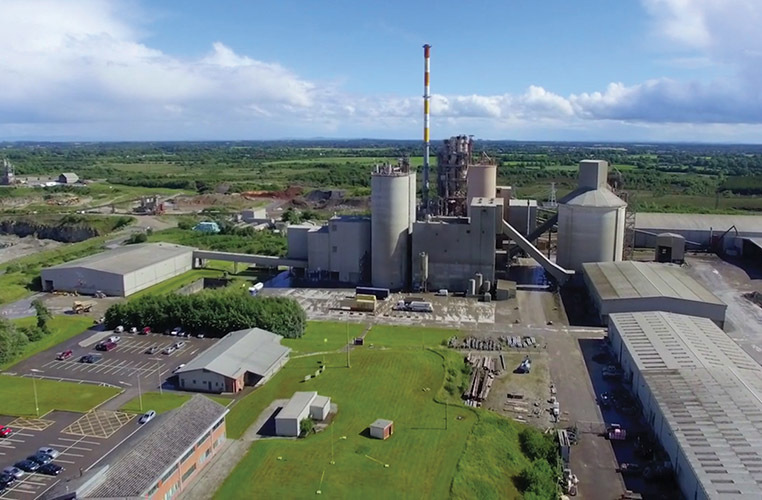 From its state-of-the-art manufacturing plant near Kinnegad, County Westmeath, Lagan Cement manufactures a range of high-quality bulk and bagged cement products for distribution across the island of Ireland and the UK. We touched base with Quarry & Dispatch Senior Manager Alan Glennon to get an update on day-to-day activities. Lagan Cement is an invaluable operation, which plays a key role in keeping the wheels of the local economy in the midlands – and further afield – turning. As well as supplying premium cement products to the build environment, the Kinnegad-based arm of the Lagan Group generates massive employment … not least in the haulage industry. “All of our haulage is subcontracted and we have excellent hauliers working for us,” he notes. “We have 40+ hauliers supplying our product and I’m also responsible for the raw materials coming into site, which means there could be more than 60 lorries on the road for us on any given day. Since commencement of production in 2002, Lagan Cement has operated one of the most modern cement manufacturing facilities in Europe. The industry-leading cement works in Kinnegad has the capacity to produce 700,000 tonnes of high quality cement per annum for both the domestic and export markets. These products comprise CEM I 42,5 R Bulk, CEM I 52,5 R Bulk, CEM II/A-L 42,5 N Bulk and CEM II /A-L 42,5 N Bag cements. CEM II Bulk is a high quality general purpose cement suitable for most applications, while CEM I 42,5 R is a special purpose cement used in concrete to achieve a higher rate of early strength development compared to using CEM II Bulk. The continued success of the business is linked to a very focused and strategic approach to environmental, social and economic responsibilities. To this end, increasing their use of green renewable energy and developing their range of lower carbon CEM II type cements have been significant milestones to date in allowing Lagan Cement to grow in a sustainable way. In line with their vision, the company continues to achieve the highest standards in environmental care, Health & Safety and product quality control. “There’s a massive Health & Safety side to this,” says Alan. “All of our haulage subcontractors are a part of that. Even before they start, they go through a rigorous safety induction and they have to have all the relevant safety certs, etc. in their possession. “The hauliers are meticulously vetted and our internal Health & Safety department on site keeps all of that documentation filed and updated to ensure that the highest standards of Health & Safety are maintained. Over the years, Lagan Cement has sought and achieved a wide range of independent accreditations in recognition of outstanding performance, which reflect excellently on the professionalism and commitment of the company’s dedicated workforce. These include Benor Quality Certification; BES 6001 Responsible Sourcing Certificate; OHSAS 18001 Certification; ISO 5001 Energy Management Certificate; ISO 9001 Quality Certificate; ISO 14001 Certificate; KOMO Quality Certificate; NF Quality Certificate; and NSAI Excellence Through People Certificate. Looking to the future, Alan confirms that there will be no let-up in the pursuit of excellence: “Quality and safety are of paramount importance at Lagan Cement and we are passionate about providing our customers with quality product on time,” he concludes.